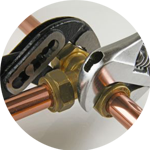 If you are struggling to find time to complete plumbing tasks, the Handy Squad is here to give you a hand. 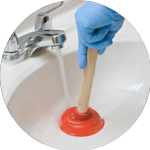 Whether you have a blocked toilet or need a radiator repaired, our team of highly skilled plumbers will be able to help. 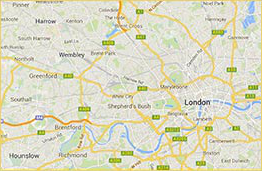 You will see us all around London in our unmissable yellow scooters and vans, so why not give your local Weybridge plumber a call? This mainly residential area in Surrey is well-known for having housed several famous residents in St George’s Hill estate, including John Lennon, Ringo Starr and Cliff Richard. Weybridge is also known as the location of an alien battle in H.G. Well’s novel The War of the Worlds in 1897. The area is home to Weybride Heath, which has many rare species of insects, birds and insectivorous plants. Weybridge has a variety of sports clubs, including ECB Premier League club Weybridge Cricket Club, Weybridge Vandals Rugby Club and Weybridge Rowing Club. The Handy Squad covers Weybridge, along with Twickenham, Felham and Richmond. No matter where you are, our highly skilled team will be with you in no time at all. 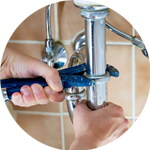 We offer all the services you might require, from repairing leaking taps to installing baths and showers. 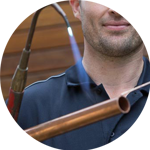 If you are looking for other handyman services, our Handyman London team offers office maintenance and repairs, carpentry, jet washing and much more.